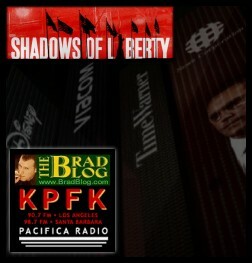 " 'Shadows of Liberty' Finally Emerges from the Shadows on Today's KPFK 'BradCast'	"
After watching Shadows of Liberty: The Media Monopoly in American Journalism over the weekend, I didn't expect I'd be surprised by much during my interview with the documentary's filmmaker Jean-Philippe Tremblay on The BradCast today on KPFK/Pacifica Radio. But I was. It's a beautiful and maddening film, featuring many voices --- such as Julian Assange, John Nichols, Dan Rather, Amy Goodman, Robert Parry, Robert McChesney, Dan Ellsberg, Sibel Edmonds and many more, including even yours truly --- who will be familiar to readers of The BRAD BLOG. While aspects of a number of the stories told in the film may be familiar, there were elements that even I hadn't heard about it, in just about every one of them. I had planned to ask Tremblay about his struggles finding commercial theatrical distribution for the film in the U.S. I'd presumed that, at least, would be next to impossible, given the subject matter of the film (the corporate takeover/merger of the near-entirety of our mainstream media in collusion with the highest levels of the U.S. government.) What I hadn't counted on --- what caught me completely off-guard --- was that Tremblay said that, while the film has been featured at prestigious film festivals around the world, the bulk of the major festivals in the U.S. had turned the film down. Yes, those supposedly "independent" film festivals are, apparently, not quite as independent as they used to be, it seems. And, the even better news still: Shadows of Liberty will air on actual television, beginning Friday, April 5th at 8pm ET and PT on independent KCET in Los Angeles and nationwide on Link TV (DISH Channel 9410, DIRECTTV Channel 375). Until then, you can listen to my conversation with Tremblay from today's BradCast, which includes a number of clips from the film --- along with a few more items of note in the news week (such as concerns about the 100% unverifiable voting systems set for use in the race of Stephen Colbert's sister, Elizabeth Colbert Busch, in her run for the U.S. House in S. Carolina against former Gov. Mark Sanford; the Virginia GOP voter registration worker who was caught tossing registration forms into a dumpster just before the Presidential Election last year, but who seems to now be getting off the hook, and, of course, a visit from our own Desi Doyen, as usual, with the latest Green News Report) --- all right now here. P.S. Please be the media and spread the word. Thanks. « PREVIOUS STORY "Felony Charges Dropped for Virginia Republican Who Trashed Voter Registration Forms Last Year"
"'Shadows of Liberty' Finally Emerges from the Shadows on Today's KPFK 'BradCast'"
Good show brother. I'm disturbed the general populace doesn't have the info. Hmmmmmmmm, what's wrong with this picture? CorpoRATe control everyone? I think even old Walt disney would roll over in his grave for this state of affairs! He believed in the power of human imagine nation. Kudos Brad. Your on-air interview of Jean-Philippe Tremblay was as outstanding as any I've heard from Bill Moyers' Journal. Too bad it wasn't televised, so listeners could have seen the clips you played in real time. "... the major festivals in the U.S. had turned the film down. Yes, those supposedly "independent" film festivals are, apparently, not quite as independent as they used to be, it seems ..."
And soon the news will be widely generated by AI software (MOMCOM 2.0). Some large news sites already use it (ibid). How may Canadians watch this film? Access from Canada is being blocked. I have a contact with Canadian TV. Canada is kind of America's puppet, but does occasionally act independently. Blocking Canadian IP's is stupid. If we have to, we can just use IP-masking programs[eg http://www.hotspotshield.com/], so why bother blocking it. Again, that is just stupid, sorry. So please stop blocking Canada, American broadcasters --- that is just futile, stupid, technologically ignorant, and backwards. Can't seem to get the video to play here in the US either.